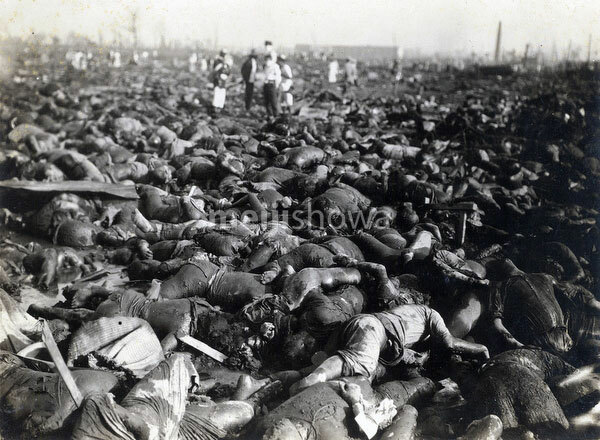 Piled up victims of the Great Kanto Earthquake (Kanto Daishinsai) of September 1, 1923 at the Honjo Army Clothing Depot (陸軍本所被服廠, Rikugun Honjo Hifukusho) in Tokyo. A firestorm engulfed the former depot and trapped the 38,000 people who had sought shelter here. With almost no survivors, it was the biggest single loss of life of the quake. The quake, with an estimated magnitude between 7.9 and 8.4 on the Richter scale, devastated Tokyo, the port city of Yokohama, surrounding prefectures of Chiba, Kanagawa, and Shizuoka, and claimed over 140,000 victims.